I'm so outdated now with wrestling news. My personal e-mail went down for more than a month where I get my daily dose of wrestling news. And since Jack TV isn't part of our cable channel lineup anymore, I'm not able to watch the WWE shows on cable. Smackdown and Raw are still shown in local TV but only on weekends when I'm usually out. So it was a surprise for me to know only today that Batista is back here in Manila ! 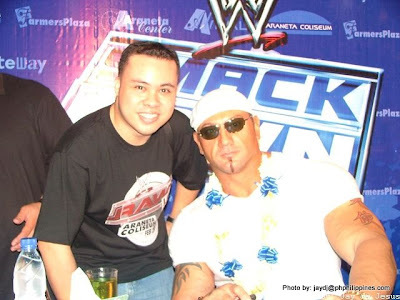 Batista will be at SM Megamall on March 3, 2009 2:30pm for a scheduled wrestling appearance for all his WWE and Pinoy fans. He's here on a promotional tour for WWE. Even if I won't be able to go to any of his appearances this time, I'm happy to have had the opportunity last time he was here in 2006 along with other WWE Superstars visited for a 2 day wrestling extravaganza at the Araneta Coliseum. My wrestling barkada (composed of my former officemate, his girlfriend and her daughter) all walk and planned 6 months before the event. We saved up every month so we could have enough money to buy tickets at the lower box area. And it was worth it ! We also won meet and greet invites to Batista and an autograph signing while he was here. So I guess that was my Batista Experience. Here are some pics from the Smackdown tour in 2006. Now I chant.... BATISTA ! BATISTA ! BATISTA !! !